Andrew has a summer job pulling carts for the senior ladies league at the Kingsville Golf and Country Club. He loves his job, especially knowing that after each shift him and his mom grab a hot dog at the cantina. 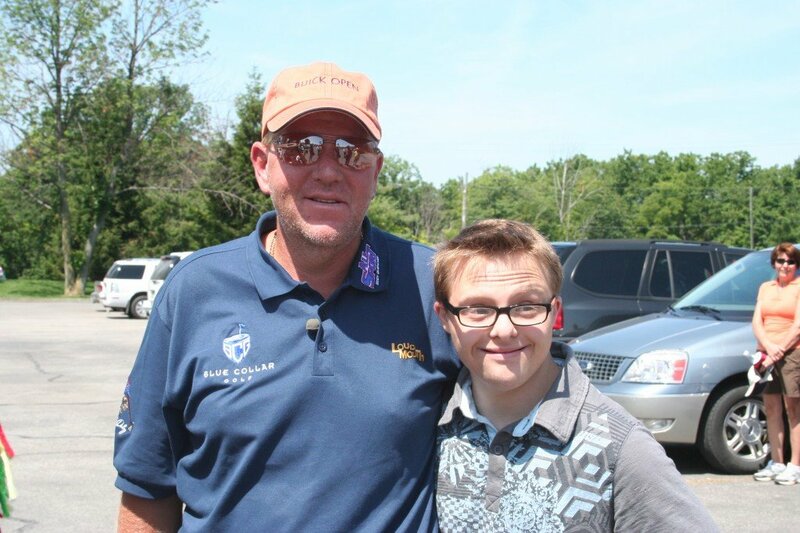 Recently PGA Golf Pro John Daly played a round of golf at the club, so Andrew and his mom took the time to present John with one of Andrew’s “Rock On” t-shirts. John was incredibly gracious and posed for a picture with Andrew. Many thanks to long-time Member Don Revait for helping coordinate the greeting! Andrew meeting John and giving him one of his t-shirts. How cool is that! Watching John chip one in. Andrew and long time member, Don Revait who helped coordinate the greeting! This entry was posted in other, Golf Tournaments and tagged Andrew Banar, Down syndrome, Face To Face, John Daly, John Fairley, Kingsville Golf and Cou, Kingsville Ontario, PGA, PGA Pro Golf. Bookmark the permalink.